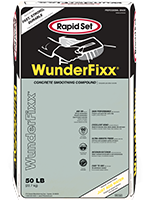 For your high-performance patching and detailing needs, use Rapid Set® WunderFixx® Concrete Patching Compound. 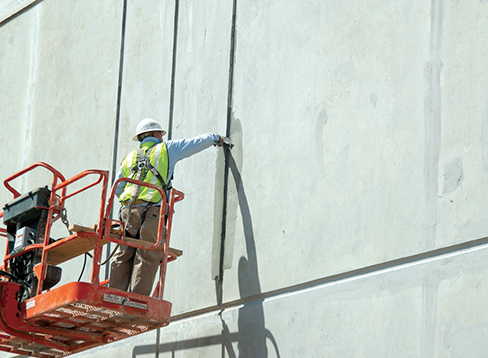 WunderFixx is a fast-setting, durable, one-component concrete patching material formulated with a premium-grade hydraulic cement, high-performance polymers and a finely ground aggregate. It is suitable for moist environments on interior and exterior projects, and ideal for patching and detailing on tilt-up panels, pre-cast concrete, concrete block and other concrete surfaces. Mix WunderFixx with water to produce a workable, easy-to-apply mixture with excellent bonding characteristics. Trowel WunderFixx over existing concrete from featheredge to 1/2-inch thick to achieve a smooth, uniform concrete appearance. After applying, you may sand WunderFixx to achieve an ultra-smooth finish.